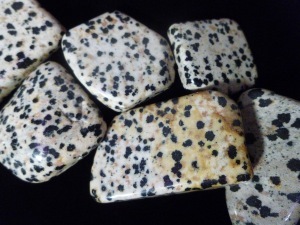 Dalmatian Jasper, so called because of it’s look, is a silicate, microcrystalline quartz, often with organic matter or other minerals as inclusions. It is said to be a protective stone and healing stone on many levels. 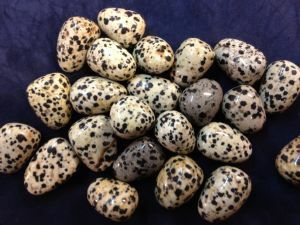 On a emotional side Dalmatian Jasper is said to help bring a joy and uplift to one by letting go of any burden for a reawaken sense of fun and humour. Physically it is said to boost immune system and remove toxins. May also help with muscle problems, bowel disorders in particularly IBS. Skin problems and allergic rashes are also considered to be helped by the use Dalmatian Jasper.